I expected a rebuild to not have a historically bad offense. Teams rebuild every year, yet somehow manage not to have one of the 5 worst units of all time. "For years I’ve told disbelieving friends that I travel to see the Bills as much as I do because I’m a loyal fan. I tell them the Bills are working on getting better. Driving home after the Bears game I had a lot of time to think about why I travel to see the Bills. There’s no good explanation other than it’s a bad habit. My Bills caps and my sweatshirts too, and my zubas and my Bills Santa/elf cap are still in my trunk, but to be honest, I don’t know why." 44 years a season ticket holder, true red white, and blue, travel 5 hours, missed 3 home games in that time and I am right there with you. Coming home Sunday night I told my wife I didn't know if I could do this anymore especially with 3 meaningless games in December. Like you I still haven;t unloaded the truck, just am beat down. They're killin me Shaw, They're killin me! And finally, In the 2018 NFL where it is illegal to play defense how can this offense be so bad. And here's the worst part... it's not just McDimwit ... The O-line coaching is horrible... The OC is a punchline to a bad joke.... Even Special Teams is in the gutter. It's a complete culture of ineptitude, and unaccountability. One more year of watching that unfold seems like a lot. i dont really see the big big difference here. Yes, the offense is really really bad. But when you look at the other comparable teams I’m guessing the Bills would actually have the best record of the entire bunch if Allen wasn’t hurt. Again....THIS is what a transitional rebuild year looks like. Still nicely on pace to break our own franchise record for worst season in 1971 in terms of point differential. Also currently on pace with the 1977 Tampa Bay Bucs for the record of having as many TDs as Pick-6s. The offense is so bad, and we've given up so many scores by the opponents' defense, we would be better off if we did this whenever we gain possession of the ball: on first down, take a knee. on second down and third down let the clock bleed down as much as possible, and take a knee; on fourth down, punt the ball. Of course we could punt on first down, but this way takes more time off the clock to give our defense a little breather. I think the players truly did not like Rex's staff coaching the defensive side of the ball. I think the players knew that they could be much better and the scheme was making them look bad. McD and Frazier brought a better scheme and was a welcome change. I think they had continuity in the Offense with McCoy, Taylor, Clay, and most of the OL - although they certainly felt the lack of talent that walked or was traded away at WR and the lack of depth at RB. As well as the downgradee in coaching on the Offensive side of the ball at OC and OL coach. The retirement of Wood and the Incognito situation while may be unexpected this year, but they were both likely to retire or decline soon anyhow - this was something that both Whaley and McD/Beane failed to have any contingency for and I'm sorry but 5th round picks and later are long shots to be replacements as good or better than Wood and Incognito. You lose these two interior anchors, and then trade away a proven above average starter at T, so that you can pick an unproven raw QB to play behind a decimated line with the best player being a Tackle going into his 2nd year after not even a full season starting. You let your starting MLB walk in FA and create the need at the position, then use high value extra picks that could address some of the holes so that you can draft a MLB that is a specimen but still raw. You trade away a professional veteran presence at QB that may not want to relinquish the job, but don't you want your franchise prospect to unseat the guy that preceded him because he is undeniably better. You then acquire no veteran with a decent body of NFL work that can provide adequate play should the rookie not be ready, and then go into the season with a raw rookie, and a 2nd year guy that didn't show much of anything to think he could hold down the position while your rookie gets acclimated to the NFL or should he struggle. You show that you can put together pieces on D with the same cap limitations that apply to the team, but the Offensive moves show a lack of understanding. You bring in an unproven NFL coordinator that has done nothing but struggle in his stints as an OC in the NFL. You keep an OL coach that has had a maligned career, and you convert a WR coach into a QB coach to develop your rookie. People can talk about the cap and the picks and that building takes time, but there is a body of work already on the books and to think that it will magically get better in the offseason with the FO and Coaching stafff and what they have done so far is pretty optimistic. I want to be optimistic, but I'm paying attention to these guys and I just don't see anything that shows any semblance of an understanding of how to put together a good Offensive coaching staff or good Offensive personnel. It's great that they went out and got a QB, and Allen looks much better than I thought he would, but he has a long, long way to go - it's hard to put your finger on how much of it has to do with the Offensive scheme vs the lack of talent at QB and Offense in general. There is no question that both are responsible for the results, but it is hard to evaluate the rookie QB. I think good play design gets receivers open in the NFL, and even though the talent at WR is not great - I think the plays themselves are not putting the talent the Bills do have in a good enough position to succeed. The FA players will see what's going on with this Offense and no WR/TE is going to want to come to Buffalo to watch their stats and production decline, because that is the currency for the next payday. Maybe they'll be able to convince someone, but it will be a short honeymoon if the Offensive philosophy and play design doesn't change. The OL players were not thrilled with Castillo last year and lobbied for changing the schemes - again, good luck attracting good OL players to play with a coach that doesn't know how to maximize the talent's effectiveness. This is not a desirable situation for FAs and as much as money talks - so does a good situation to succeed, because that means money down the road too. Wow! That puts it all together in one place. Thanks. Your comment about free agents not being interested in Buffalo is telling. Watching stats decline. Not that he was here on McBeane's watch, but after his first two seasons in the league TO had only season below 1000 yards when he played in 16 games, and that one season was in Buffalo. Well, Deek, this is a very good point and maybe I should calm down. However, the things I point out in my post still bother me. They have less to do with who the QB than whether the team is prepared to play in the modern NFL. Which is why we should at least target 1 WR and 1 TE early in the draft. Lineman are not as stat driven in contracts.. Also WRs are usually divas and most likely will be paid more than they are worth in FA. The modern NFL top teams come in with a game plan that paves out the offensive plays, with minimal concern for the opponent and carries them out come hell or high water. The elite QBs are able to take these plans and adjust them on the fly, usually by getting to the line with plenty of time to read the D and adjust (or pretend to). Walsh and Montana used to boast about starting the game with 12 plays on O set before kickoff, this is standard now. If your QB is reacting to the D as a play unfolds, with anything but total confidence, or hoping to find loopholes to think and react to, he is a goner. 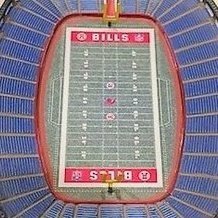 The Bills have not had a plan for the next play, let alone an entire series, since Orton, even with TT he was waiting for the play from the sidelines and losing 20 seconds during 2 minute drills. Maybe I need to dial it all back a bit, as I said to Deek. I just looked at Football Outsiders, curious about where the Bills defense ranks. According to Football Outsiders, the Bills have the second best defense in the league. That made me interested in who is first. Turns out the Bears are first. And that is another explanation for why the Bills were dismantled on Sunday. Not only to the put the worst offense in the league on the field, but they were up against the best defense. Nine points against the Bears is a moral victory for the Bills offense. The difference is that the others look like (bad) NFL teams, whereas over half the time, we look like a college team. They have bad offenses. We have maybe the worst offense of all time. It's easy for me to imagine a normal bad offense jumping 10+ spots the following year just from new personnel and growth of young players. Make it 15-20 if the team also upgrades the coaching. But it's hard for me to imagine going from worst ever to anything more than bottom 5 next year. I have no problem with the Bills' record. I have a problem with how they've gotten that record. Ayjent's post above does a good job breaking down a lot of the issues on the offensive side of the ball. I don't trust that the same folks who thought we'd be okay starting Peterman until Allen was ready will be able to turn around the offense. Even if our QB coach is replaced, the fact that a WR coach was hired for that job in the first place is alarming. Will the offense be better next year? Yeah, probably. It's really hard to be historically bad. Just regression to the mean should result in a big improvement, albeit still at a bottom 5 level. But what evidence do we have that this FO/coaching staff will ever do better than that? As I've been saying all year, I think coaching is more important talent, so I'm generally on board with you. However, the one position where a talent upgrade can make a real difference is quarterback. I want to see Allen sit this week and return after bye. Let's see how much better the offense gets with him back there. I think you and I might be surprised. As an example, imagine how much better the offense would have looked with Fitzpatrick instead of Anderson and Peterman. Fitz ain't a star, but he knows how to play the position. One other thing that people need to get their heads around too is that these guys had a playoff roster last year (albeit by a slim margin, but a playoff roster nonetheless). It wouldn't have been difficult to keep that team relatively intact and make changes where you thought could make improvements. If you don't think that is what they thought they were doing going into this year, I don't know what to tell you because the other option is that they purposely made the team worse so that they could turn up the heat on their jobs with a necessity to get a lot of decisions right this upcoming offseason. Just logically think about the latter as a stratagem for job security and ultimate success. I know that the latter may seem like a good way to explain what these guys are doing in the best possible light and I think that's fine - we all have our coping mechanisms with a bad team. But if I'm betting one way or the other I'm guessing they didn't anticipate the Offense being this bad and thought that they would be no worse than last year, with maybe some improvement at WR (healthy Benjamin and Jones taking a step up in his development), more ups and downs in QB play but better passing game, and some fixable issues on the OL. This is not going as planned for them and that should concern all of us as fans. I think it's a little of both - they were making roster changes to continue to move out contracts of guys that didn't fit, and they've also been surprised. During the off-season McDermott said something like "we're going to get worse before we get better." He clearly said it in connection with expectations of some that the Bills would make the playoffs again this season. He didn't explain why, but he'd already lost Wood and I think he knew he was losing Richie. So I don't think McBeane are surprised that they're losing more than winning. I think they're surprised they aren't around .500 and surprised they're getting blown out. I would guess they expected Miller/DuCasse to take a bigger step forward the right tackle solution to be better. They probably also thought that between Groy and Bodine, they would be okay at center. I think the line's actually been stepping up in pass protection lately; it's the run game that is horrible. I think they expected the wideouts to progress as you suggested (and I think they have). And they expected they'd be better at QB. I think Benjamin's return to form and Jones's progress are masked by the fact that the QBs are doing nothing for them. And it's at QB that McBeane deserve the most criticism. Allen looked like he might save their bacon, but then he got injured. In retrospect, Beane taking the only QB left after the free agent QB musical chairs was a mistake. The mistake was compounded, badly, by assuming they could do with McCarron altogether. That happened because, for the second season in a row, McDermott badly misjudged Peterman's ability to get the job done. As I said in a post up above, the one thing that may save next season is Allen. Give him the last five games this season to build on what he's learned playing and watching. Bring in some appropriate help on the line and at receiver, keep McCoy and Ivory (deal with them the following year). A good QB can make a big difference. Give him decent protection and get the run game going, and this could all look different. Of course, the other question is whether Daboll has any idea how to build a modern offense. I simply have no answer there. Thanks Shaw...and yes this is painful to watch. But the Texans game was there for the taking until Allen went out, and since then the wheels have come off. Win that game and the Bills are a respectable 3-3, on a three out of four roll, heading to Indianapolis to play a failing Colts team. Instead they limp into Indy without their 'franchise rookie'. Football is a game of momentum, even from week to week. I'm guessing this is a pretty deflated Locker Room right now. If the critics know that the Bills are out of it already, don't you think the players do to? Now, its over, and we have to see if the Coaching Staff can keep the Defense playing at a high level. If not it's going to feel like the team has yet another set of needs come the offseason. I'm high on Allen. I think he sees the field pretty well for a rookie. Maybe to put a finer point on it, I think he sees the risks pretty well for a rookie. I don't think he sees all the opportunities yet. But I think he sees the risks, and I don't think he throws a pick six to lose the game. And I agree with those who suggested that his injury may have been a blessing in disguise. He's seen the field, and now he's had a break to study, to consolidate what he knows and add to it by watching film and watching things go wrong with the other two QBs. He hasn't had the pressure of game prep. Now he will get to come back, but his new knowledge to work for a few weeks, then get the off season to consolidate and grow some more. Then a full set of OTAs and training camp as the starter. It's better than what Darnold and Mayfield are going through, just grinding through week after week with failures piling up and no time to step back, take a breath and get recharged. But as we've been discussing in these posts, he's the only hope. If he can't put it together for next season, along with some decent offensive coaching, we're going to be back to wash, rinse, repeat. I don't see it in regards to Allen. He has tendency to run after his first checkdown. A lot like Tyrod with a bigger upside. He has accuracy issues dating back to college. Blame his WR 's all you want but the best QB's make their WR's better. You'd be running too if your protection was the Bills O line and backs. Accuracy fears seem well founded. Well, the Bills were not in a position to have their cake and eat it too. They just didn’t have a veteran all set up to be a mentor. Tyrod was not that guy. So we’ll see if they can woo a veteran to join the roster in the offseason. For what it’s worth I was in the ‘go get Alex Smith camp’ some years ago but they chose not to go there. If they had, and he was there for the asking, many things would be different. Agreed. You're a lot higher on Allen than I am, but I'll wait and see on that front. He's probably not as bad as I feared he'd be, but what still worries me is that I can't off the top of my head think of a play he's made with his arm. Once he gets back, hopefully we see some progress/development from Allen. On a side note, I'm really sick of people using Goff and Trubisky to claim Allen/the offense's future is bright. Those guys turned it around because Jeff Fisher and John Fox were canned and replaced with Sean McVay and Matt Nagy. Which group does our coaching staff resemble more? I think that if you put Josh Allen on the Chiefs he plays like Mahomes. That coach and that talent create an entirely different environment for the QB. Question is when will Allen see talent and a coach like that in Buffalo? Pretty much the entire offense coaching staff will need to be replaced. I don't see who/what is there now having a positive effect on Allen's development or being able to bring in much needed talent. Since McD had two chances to bring in the staff he wanted, and has failed, I don't think he should get, or deserves, a third chance. If the Pegulas were smart, they would bring in a third party (i.e. offensive consultant) to guide those decisions. McD should have to live with that since he has been prone to make very questionable decisions regarding offensive matters. If Bruce Arians doesn't want to coach, he'd be perfect for the consultant role. There only a few reasons why he failed to learn the lesson: (1) The lesson isn’t taught – bad coaching. (2) The lesson is taught but not in a way that Thomas actually learns it – bad coaching. (3) The lesson is taught properly and Thomas either can’t learn or refuses to learn it; in either of those cases, Thomas should not be on the team – bad coaching. I read it all and felt a few points needed emphasis and it started in the offseason when someone decided that the offensive line would do okay without Woods, Incognito. When someone decided that Nathan Peterman would be a fine starting QB while Allen sits and learns. When someone hired a QB coach to help develop a rookie QB and a very inexperienced 2nd year QB and that QB coach had never been a QB coach previously. He was a WR coach. When someone decided that the team didn't need a veteran QB on the roster for the start of the season to help guide the inexperienced QBs that didn't know how to read a pre-snap defense or set protections. Someone decided at the start of the season to not use the best player on offense very often (McCoy) and force the newbie QBs to carry the offense. Bottom line is, the coaching is failing everywhere on the offensive side of the ball. The question is, what will McD do about it? What will Beane do about it? What will the owners do about it?